The International Dutch Oven Society or IDOS is the premier organization for all Dutch oven enthusiasts. Learn More. The Dutch Oven News is published by IDOS four times a year. It is full or recipes, helpful times, news and much much more. Members of IDOS can read back issues and search the Recipes archive. Click here for a sample from a previous issue. IDOS - Southern Californai Chapter. This is the chapter I belong to. We have fun at the local "DOG's", Dutch Oven Gatherings where we cook, sample delicious food and make new friends. Click here to learn more. National Ornamental And Miscellaneous Metals Association is not about Dutch ovens but it is an organization that I belong to that promotes excellence in the welding industry. Click here to go to their website. Artist-Blacksmith's Association of North America deals more with blacksmithing and how thigs were done in the old days. They publish two beautiful magazines every quarter. Their website is here. Here is a nice magazine I got from a friend. 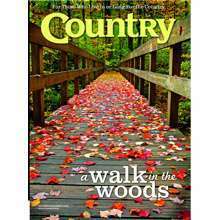 It has articles about living in the country. You can find good recipes here. Click here for the website. Recently I wrote an article for this magazine.